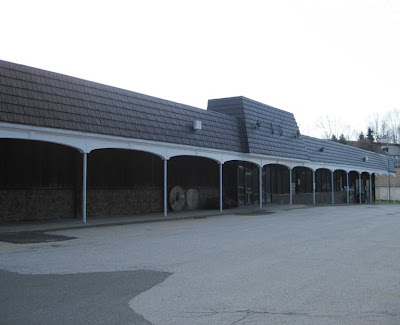 Here is... what I believe to be... the very last pitched-roof Acme still open for business. Other pitched-roof locations still exist but have had additions put on and renovations done that disguise their former distinct features. 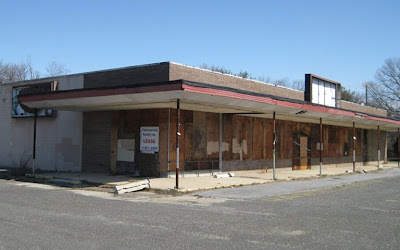 I think the only other pitched-roof store that is still open is in Cape May, NJ. But renovations to that store have covered up the glass facade. 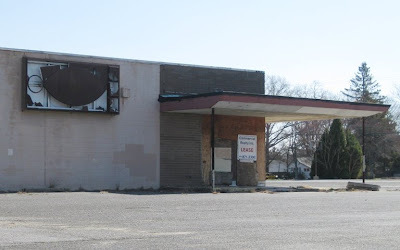 This store may be the only one to remain virtually intact since it first opened. Neighborhood Acmes like this one have always offered all sorts of gardening and lawn supplies (as you can see lined up in front of the windows). 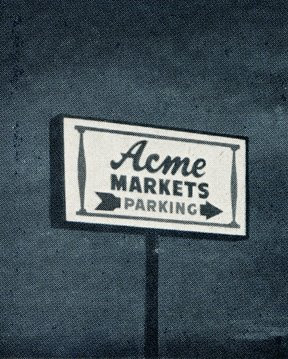 Back in the 80's, Acme was famous for it's half-priced plant sales. Stores would be filled with plants just before the sale and would easily sell out in just a few days. The green doors to the right are for produce deliveries. 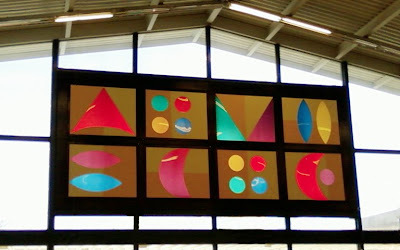 Just a couple of opaque panels have been put up over the entrance. Most pitched-roof stores had many more put in. 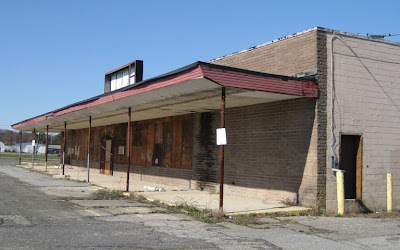 You can see an example of this of the abandoned Acme in the NJ: Yardville post. There are only one set of doors to walk through when you enter. Once in the front doors you are completely in the store. A massive blast of air from above greets you as you walk in to keep the outside air out. 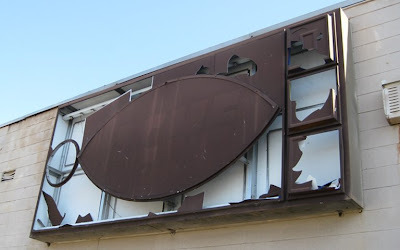 The outside sign appears to just be a canvas sheet pulled over the frame of the old fish-eye logo sign. I personally think this new logo looks much better with white letters on a red background. The parking lot signs are done that way as you can see in a photo down below. 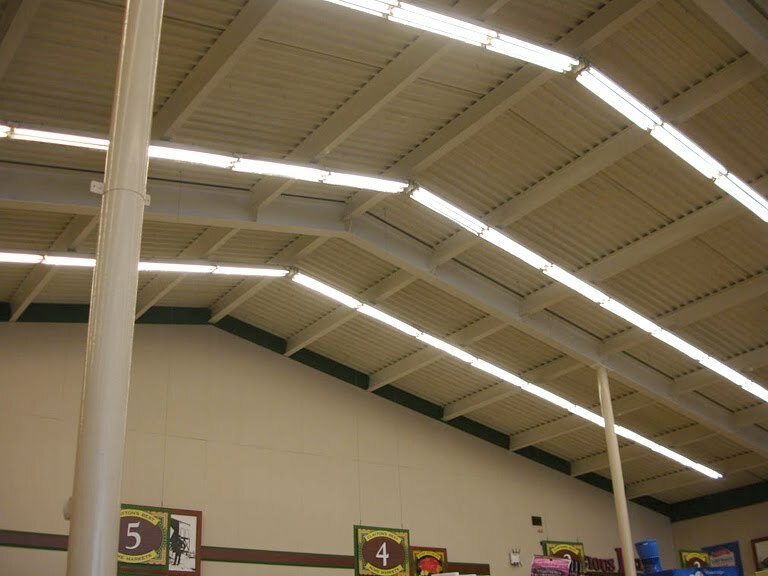 The greatest design feature ever for a grocery store? Why yes, yes it is! All pitched-roof Acmes had this design treatment on the inside. Just incredible. I was so excited to see this one still intact. Possibly the very last of it's kind. 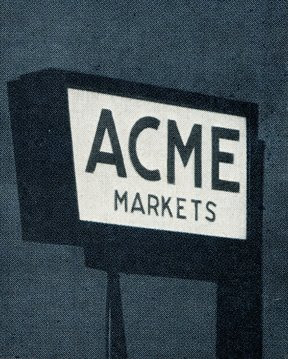 I believe I read somewhere that Acme had commissioned a well known artist in the 60's to design this sign. 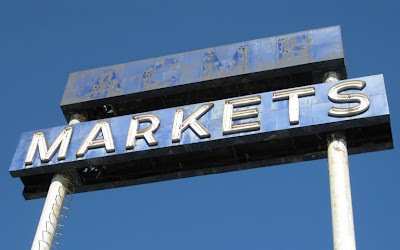 The areas around the abstract lettering are silver in color but appear brown here due to the sun shinning on the sign. I hope to get back to this store sometime after sunset to get more pictures. This sign would look very different when it's dark outside. Here's an interior shot just to show the decor package this store has. Many smaller Acmes have this look. Old black and white photos of the town are hanging on the walls instead of department names. The Deli is the only department with it's name on the wall. The orangish picture on the right wall there said something like "Oven Fresh Bakery", yet this store has no fresh baked goods. The aisle signs say something like "Clayton New Jersey, Acme Markets" around the numbers. 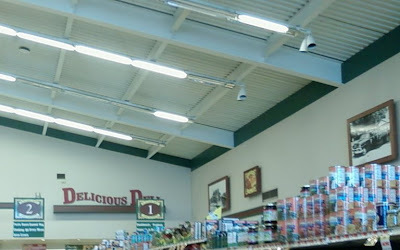 I believe those spot lights to the right have been there since the store first opened. They weren't on and I doubt they are used anymore. I have seen these above the produce departments in many pitched-roof stores. Update 10.25.11: Barry sent in this great shot of the interior roof. My interior shots are lacking since I was a little nervous taking pictures inside of stores in the blog's early days. I plan on getting back to Clayton for more extensive interior coverage. Clayton one of the all-time most visited posts on the blog. Isn't this a better look than the red letters on white? 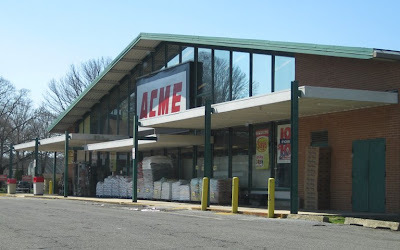 One final look at this classic Acme. And one final note... I spent about 30 minutes in this store, roaming all the aisles. It has been at least 10 years since I was in an Acme like this one. Just had to take it all in. I left the store incredibly impressed with how clean and well stocked it was. This location clearly has a dedicated team. There were alot of employees in the store getting it ready for what as hopefully going to be a very busy Saturday. Here is a look from Live Maps. 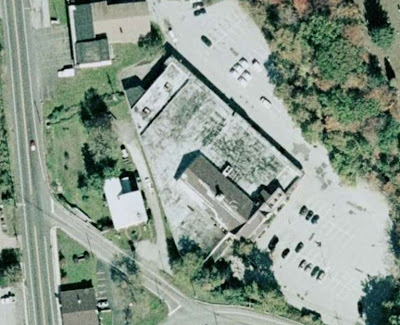 Interesting how large the property is compared to the size of the store. Would there ever be a need for that much parking? 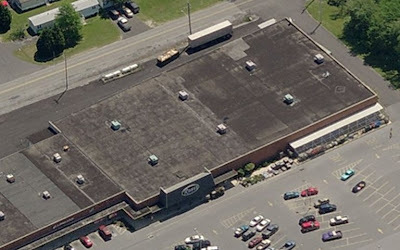 Wonder too if there was once a building next door where that area of grass is now and why Acme hasn't expanded this location. 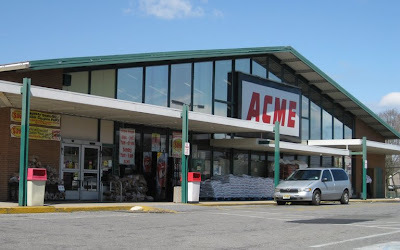 Acme Style received a tip from a reader about a week ago that the Princeton Junction Acme was closing in the near future. I did a quick google search this morning to see if there was any news out there to confirm the tip and... there is. After 39 years, this store will close for good on May 7, 2009. 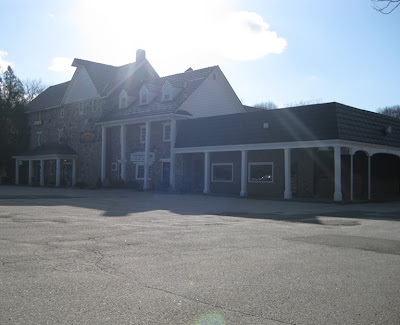 Fortunately, I was at this location about a month ago and took pictures of the inside and out. 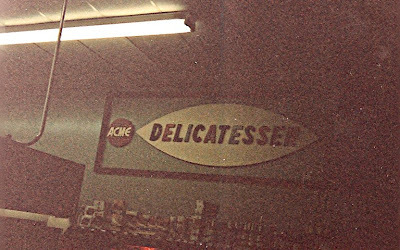 I figured this store's days were numbered as it is quite an old Acme and was still sporting the old oval logo. 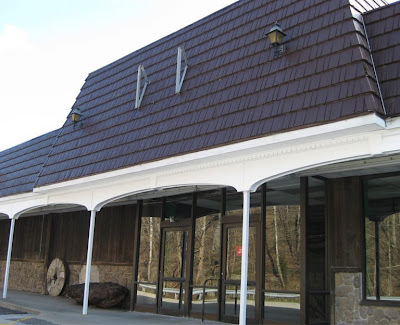 It started out as a pitched-roof store and was later expanded. You can see evidence of this from views on Live Maps. When I arrived at this location I was very surprised at how nice the interior was. Significantly upgraded within the past 10 years and nicely maintained. Clean, well-stocked, brightly lit. Very busy on the Saturday afternoon. Seemed odd that the store had old exterior signage when other stores that didn't have such extensive interior upgrades have gotten the newer logo and signage.I read a bunch of the articles that came out late last week regarding the closing. Acme's lease expires at the end of May and although they said the store is not necessarily losing money, they have decided not to continue to operate this location. 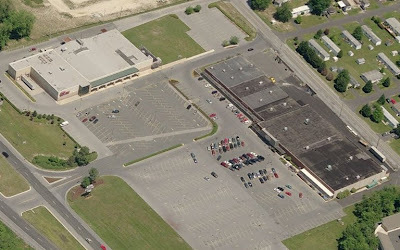 Township officials have been in talks for two years now about the possibilities of redeveloping this shopping center with hopes of giving it an "Main Street" styled shopping experience. Several developers are interested in taking over this property. 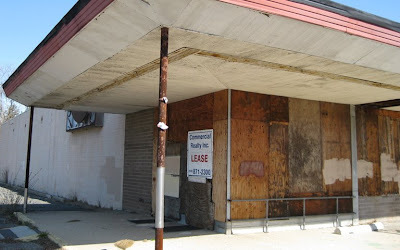 Current plans are only to upgrade the facade and find a new tenant for the Acme. Rumors are circulating that King's is interested in space. 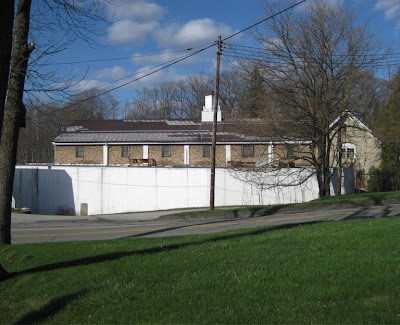 Another developer is interested in buying the property and launching a major renovations. 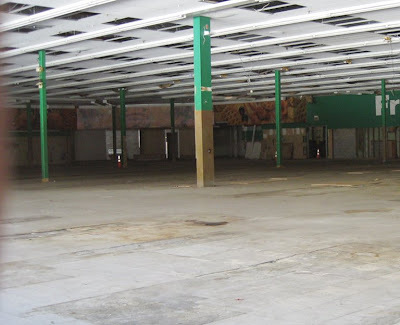 The general consensus at this point seems to be that the Acme will remain dark and empty as the many parties involved debate the future of this shopping center. 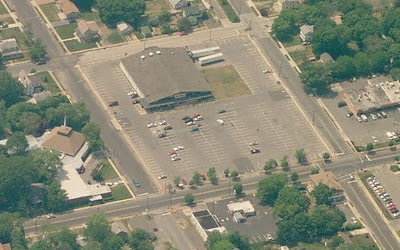 This former A&P SAV-A-CENTER is just off of Rt. 206 in Andover NJ. It started out as a regular A&P with the orange logo and was converted to a SAV-A-CENTER in the mid to late 80's. Not sure when it closed down but would guess sometime in the late 90's. 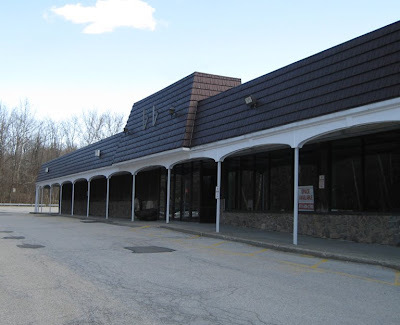 A massive ShopRite opened up about 2 miles down the road in Byram. I don't have any additional information on this store. Hopefully we'll get some commenters who can tell us more about it. Love the old light fixtures on the awning. Looks like they have been there ever since the store opened as an A&P. 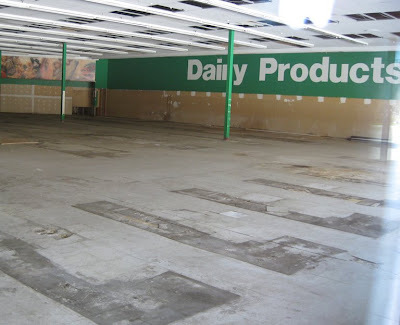 Rather strange location for a grocery store. The front of the store faces the woods. This is what you would see when you come out the Exit. 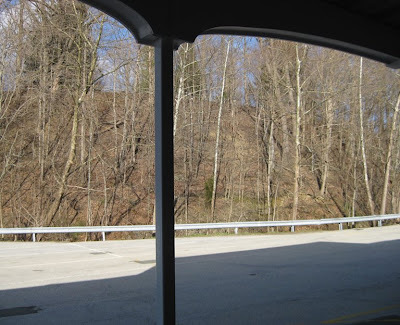 Very small parking lot between the doors and the woods. That wheel and rock must have been on the property. 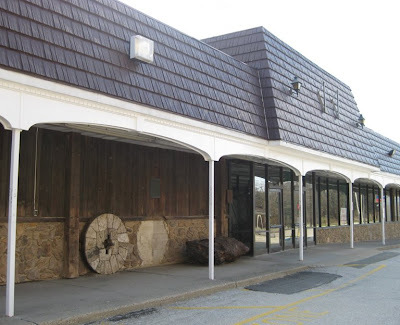 As you will see in picks later, this A&P was built around what looks like a historic builinding. Got some great interior shots. 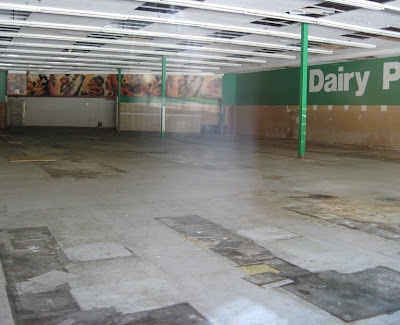 I love seeing the inside of abandoned grocery stores. I really liked the decor in the SAV-A-CENTERS. This style was used before the Super Fresh look was rolled out in the SAV-A-CENTERS. I like the bold lettering, the intense green color and the pictures of food. Looks like the Seafood department was back in that corner. The Bakery was in the left hand corner. 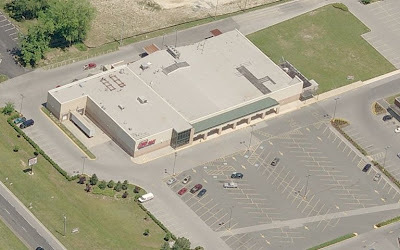 The Produce Departement may have been along the front of the store to the left of the entrance. Could get angled any more to capture the Produce imagery or sign. The is a small Post Office at the far end. Still open. You can see the old buildings here that were originally on the property. Not a great shot with the sun. Tough to time these visits with the best lighting situations! Hmmm... not sure about the "We've got the prices!" 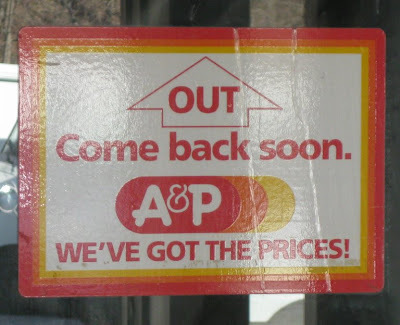 Shouldn't they have thrown in "low prices!"? 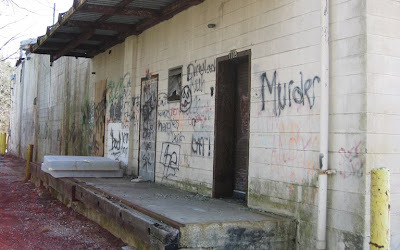 This is the back of the store. Faces Rt. 206. You can see here how the store is backs up to the local roads. 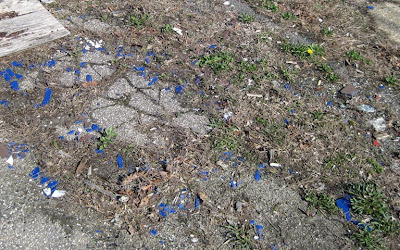 It's also downhill from the roads making it difficult to notice when you pass by. 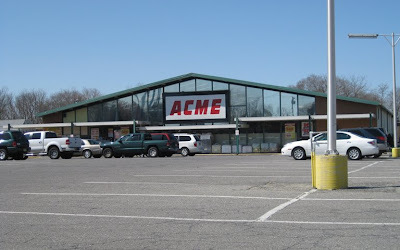 I had heard about this Acme's story years ago but was not able to track down it's location after I started Acme Style. Thanks once again to Live Maps for being an invaluable tool to search unfamiliar territory. 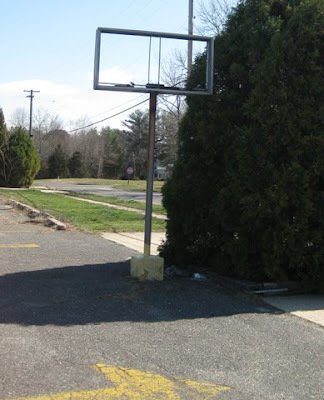 I also discovered a few more tips online after digging very deep into Millsboro's history. 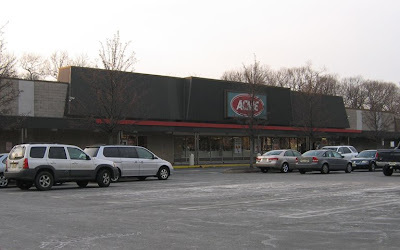 Sometime around 2001, Acme launched a massive addition and remodel to this former pitched-roof store. Price tag: $5 million. In the summer of 2002, a year after it's Grand Re-Opening, the store abruptly went out of business. Around the same time Ames closed it's doors in the shopping center just down the road after that chain had declared bankruptcy. 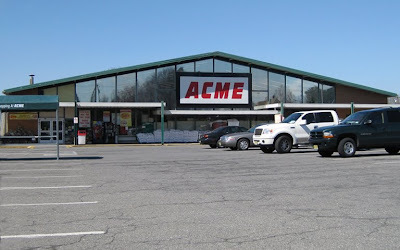 Millsboro residents and officials were baffled by Acme's decision to leave especially so soon after a costly remodel. Acme's response to the store closure was that it felt the remodel did not attract enough additional business to keep the store going. 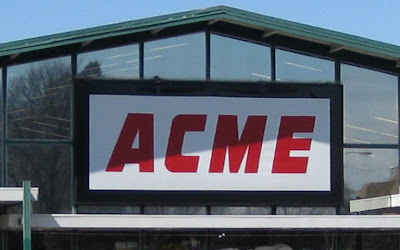 Acme claimed it lost $1 million dollars in the year following the re-opening. Now unfortunately for Acme, the timing of it's Grand Re-Opening coincided with the repaving and expansion of Rt. 113 in front of the shopping center. The project dragged on and made traffic in the area a nightmare. 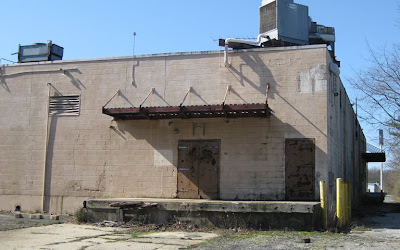 Millsboro officials agree that businesses all along 113 suffered during the road work but at the same time the town was growing steadily and businesses should have recovered quickly after the work was completed. Apparently Acme didn't see it that way. 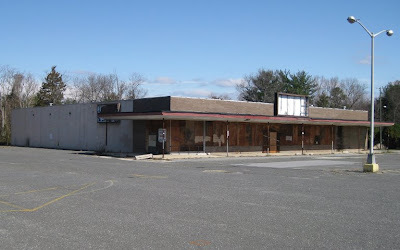 Despite having little competition in Millsboro and a growing population to attract, Acme packed up and left town. Not sure what store is in the location now. UPDATE 4.13.09: Acme Style received an email from someone familiar with this area and the Acmes of Delaware. 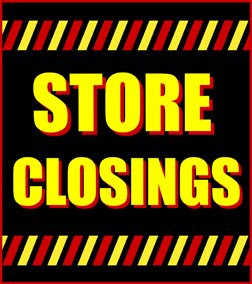 Turns out there were some Union issues that contributed to the closing of this store as well as very slow business during the non-summer months despite a first-rate remodel at this location. Here you can clearly see the remnants of the original pitched-roof Acme. Not sure what this store is today. 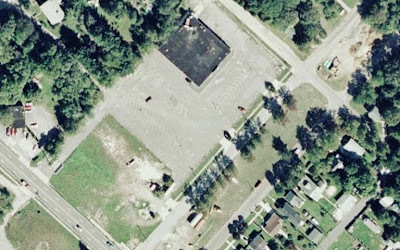 The sign can't be easily read from these satellite shots. 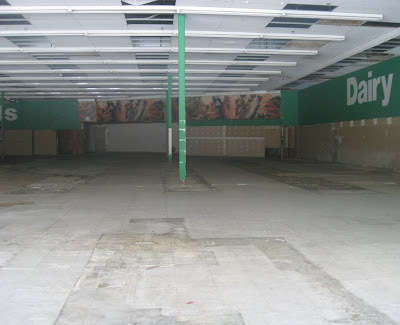 It does look like it is still a grocery store. 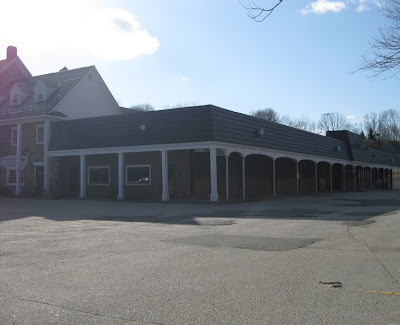 This is a shot of the store that is to the rear of the parking lot. I originally thought that this was a replacement to the pitched-roof Acme as the facade looks very similar to Acmes of the 80's. But thanks to some emails I received, I learned that this building was never an Acme. 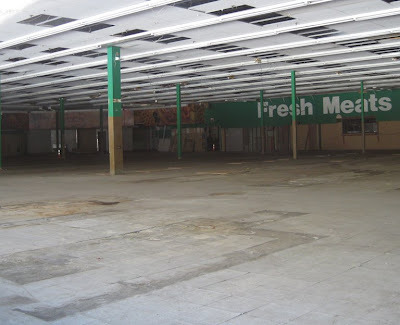 A final look at this former Acme shopping center. 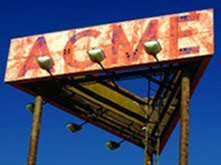 Perhaps "World Famous Abandoned Acme" would be a more appropriate title. Pictures of this store can easily be found all over the internet. A favorite among Acme fans. It's simply amazing that this property has remained completely intact since Acme went out of business sometime in the mid-90's. 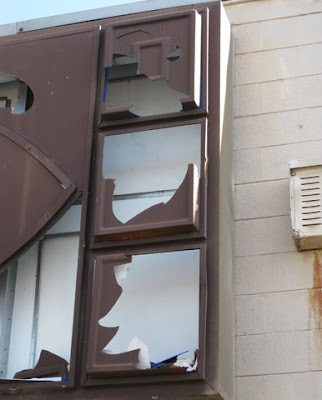 Evidence of this can be found on the sign of the side of the building. The latest version of the Acme logo was incorporated into the fish-eye logo. One very odd aspect of this store is that it sits far back from... and doesn't even face... the main road. The large Acme sign to the left is out on Rt. 30. 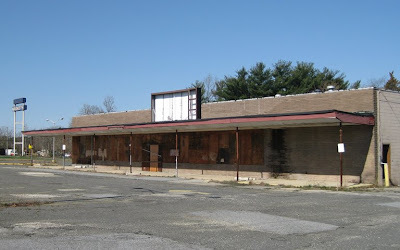 The store front is located on New York Avenue which is actually a dead end. Houses are located directly across the street, to the right side and behind. 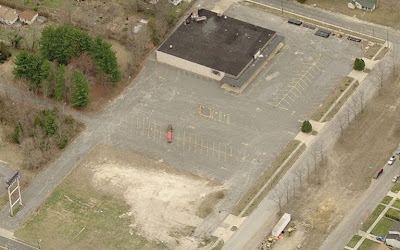 I have included aerial shots as the final pictures below to show how the area is. I would assume this store started out with the script style logo. I believe the fish-eye logo was rolled out the same time Acme retired this building style in favor of the pitched-roof design. 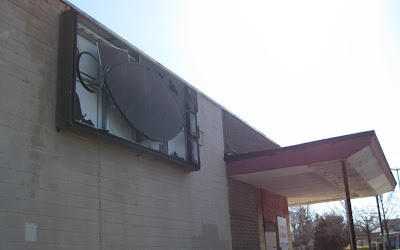 Unlike most updated stores from this era, Acme did not install the metal awning to frame the new sign, instead just sticking the new sign right to the building. 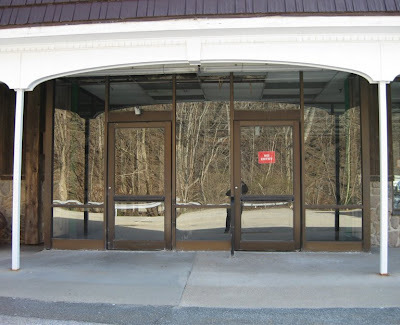 (The awnings I am talking about can be seen in the Newton Acme pics where it had since been painted green). So I wonder... did this store get the new sign before Acme decided on adding those awnings or did they just got cheap on some locations? Produce receiving door on the right corner. 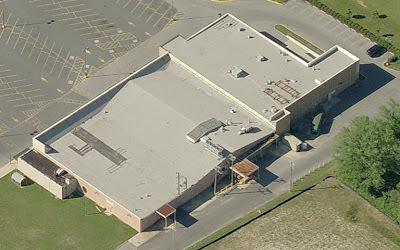 The windows up top are the employee break room and bathrooms. The colored pieces are the back side of the sign. 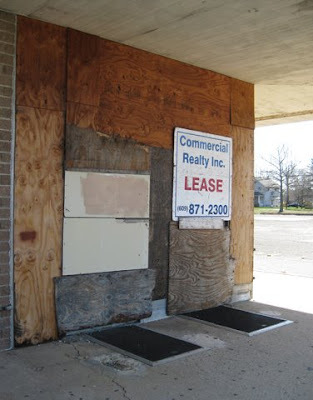 When the store was closed the sign was painted over in dark brown. I picked up several larger pieces and took them as souvenirs. 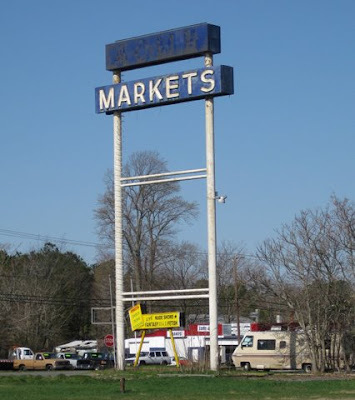 This style of Acme Market was everywhere back in the day. 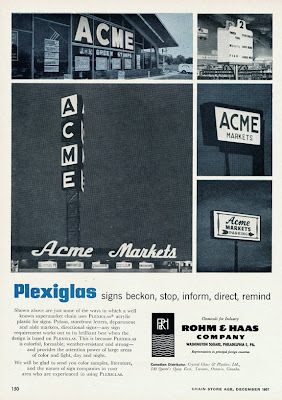 Like A&P, Acme had a standard store building design that was duplicated in hundreds of locations. Nearly every element in the same exact spot. 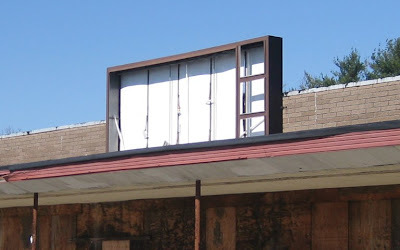 The continued on with this tradition when this style of store was retired for the pitched-roof version of the late 60's. Enter on the right, exit on the left. So tempted to pry a board off to take a look inside. 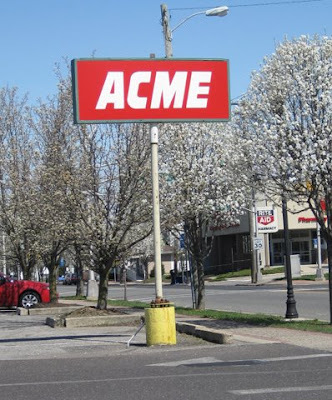 You can see the most recent version of the Acme logo was added to the old fish-eye sign. Looks like only the center section was replaced. Took a close-up so you can see what color these blocks used to be. Blue on top, red in the middle and yellow at the bottom. Dairy and frozen food receiving. Former sign by the entrance. 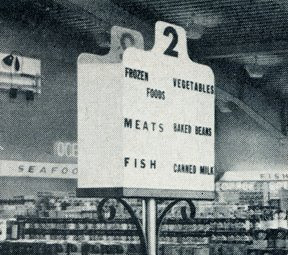 Fascinating how huge these signs were for such a small grocery store. 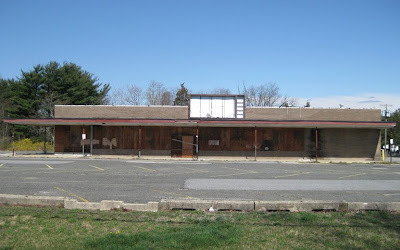 They're always a dead giveaway to a former Acme location. 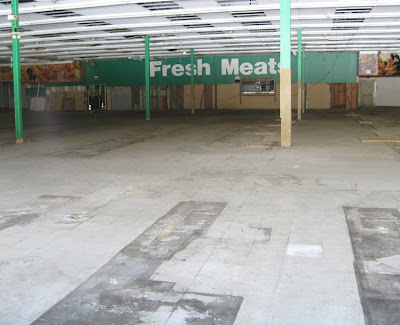 So often they were left standing with new signs put on for the store or stores that took over these old Acmes. 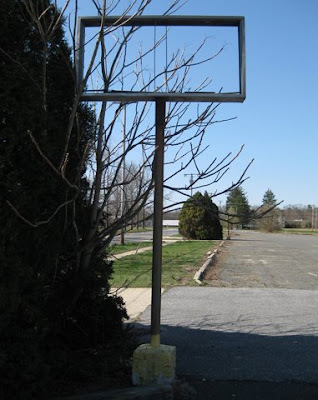 You can miss this sign when driving by. 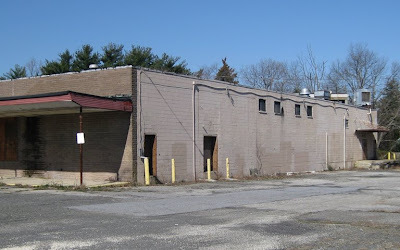 Although you can miss the building as it is tucked back off of the highway. One final look at this classic location. 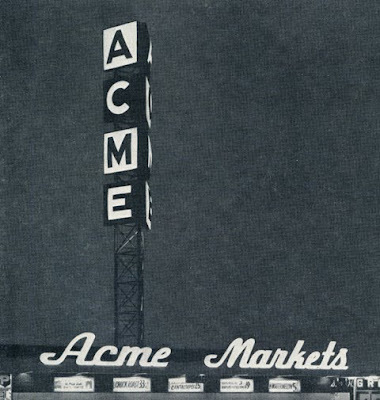 If this store remained a success Acme had plenty of room to expand. UPDATE 11.10.09: Nintendo85 commented that this store actually closed in 2002.